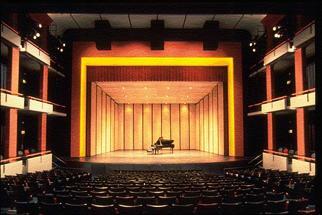 Inside the Performing Arts Center, the stage is set to let your imagination soar! This beautiful 702-seat theatre is a crowning achievement in technological wizardry with all the amenities you would expect to find at a fabulous Broadway playhouse. Not only is it ideally suited for every type of dramatic stage production, it can also serve as a concert hall for musical performances or as a civic auditorium for corporate presentations. The stage features a removable acoustical orchestra shell. When combined with the sound absorbing draperies and high tech house speaker system that produces nearly 18,000 watts of power, this orchestra shell greatly enhances the sound and quality of any music for an enjoyable listening experience your audience will not soon forget. And, with the intimate seating arrangement, there truly is not a bad seat in the house. Above stage, there's a lighting grid that's accessible both from above and below and a sophisticated fly system for fast and efficient scenery changes. Backstage, the first class operations center includes easy access loading platforms, production offices, technician rooms celebrity and chorus dressing rooms equipped with full baths and make-up facilities, all of which contribute to making your production a rousing success.